Самый главный момент, который даёт всё остальное — это CRC. Отсюда собственные страницы категорий, товаров, правила создания, требования прав и т.д. и т.п. Страницы кастомизируются. То есть, в настройках miniShop можно указать где и какие поля отображать, что в таблице товаров категории, что в странице редактирования самого товара. Эта фишка, возможно, перекочует в ресурсы самого MODX. Для узких экранов есть возможность перенести табы страницы слева вверх. Табы товара и таблица категории запоминают своё состояние. Вы можете нажимать F5, ходить туда-сюда, они будет вам усердно помогать. Переосмыслил старые привычные кнопки справа вверху, теперь там есть быстрый переход по соседним ресурсам быстрое удалениепубликация товара. Иконки на кнопках — glyphicons из Bootstrap. Работа с мультикатегориями в miniShop сделана в виде дерева — так гораздо удобнее. У товаров стало значительно больше параметров, и в будущем их можно будет расширять специальными плагинами. MiniShop нацелен на скорость, поэтому мне пришлось взять работу с изображениями в свои руки. Ведь, всем известно, как сильно тормозит сайт на MODX при использовании phpthumbof и кучи фотографий с динамической генерацией уменьшенных копий. — Flash загрузчик через кнопку. — Html5 загрузчик через drag-n-drop. — Работа через media sources. — Автоматическая генерация thumbnails заданных параметров. — Редактирование имени и описания. — Сортировка перетаскиванием. Первое изображение — основное для товара. То есть, теперь phpthumbof не нужен. Все предпросмотровые картинки генерируются при загрузке изображения. Вы можете указать нужные параметры в настройке источника файлов (для MS устанавливается свой, конечно). При изменении параметров можно перегенерировать превьюшки для всех картинок товара сразу. MiniShop использует только свои modx сниппеты, работающие через pdoTools, что даёт нам повышенную скорость и кастомизацию. Вы можете легко переименовать стандартный modx сниппет, поменять под себя его логику и использовать. Благодаря pdoTools особо напрягаться при переделке не придётся. В комплекте идут modx сниппеты для вывода картинок, каталога товаров, их опций и корзины. Все нужные стили и скрипты подключаются автоматически. Первичная настройка интернет-магазина на MODX Revo займёт от силы 10 минут. [#314] Fixed missing categories for options in settings. [#316] Added webp extension for mediaSource. Fixed load of lexicons in contexts. Added new events: "msOnBeforeGetOrderCustomer", "msOnGetOrderCustomer"
Added new events: "msOnBeforeSaveOrder" and "msOnSaveOrder"
Added "payment_link" in the snippet msGetOrder. When you change the price of a product with msOnGetProductPrice, the old_price will be changed only if the new price is lower. Fixed default path to loading services in the loadCustomClasses() method. Update the cost of an orders after product addition. Improved processing of products options. Removed call of ms2Gallery::syncFiles() from msProductData::updateProductImage(). [mgr] Add contexts list into filters at the orders page. [mgr] Fixed possible error on get orders statuses list. [mgr] Fix "xcheckbox" in a Product options. [mgr] Add "expand,collapse,check,uncheck" actions to the categories and options trees. Fixed possible E_WARNING in the snippet msOrder. Added events in the processors of msOrderProduct. Fixed the loading of product plugins when they can be loaded multiple times. Fixed fatal error on get classes in settings with some 3rd party payment methods. Fixed bug with incorrect rank of thumbnails after a sorting. Added the checking of users email when getting a customer id for new order. Fixed possible error in log on create a new product from cli mode. [#242] Ability to specify only needed options in the snippet msProductOptions. [#212, #241] Fixed handling of a product options with a dot in the name. [#240] Fixed the reset of date fields when product has been edited via category grid. [#239] Fixed duplicate and empty options in msProductData. [#229, #238] Categories tree now respects the "resource_tree_node_name_fallback" system setting. [#236] Ability to display category columns of an ordered product. [#231] Snippet msOptions now transfers id of a product into a chunk. [#230] Fixed the inability to change vendor of a product more than 1 times. [#228] Possible fix for "empty file" in product gallery on some server configurations. [#227] Improved performance of the grid with options in settings. Fixed error when system setting "ms2_product_tab_gallery" is disabled. Fixed error with overwrite product options when update from category grid. [#222] Optimized some code in chunks. [msGallery] Improved fetching of thumbnails in the snippet. [#220] [mgr] Improved the total numbers in the form of orders. msPaymentHandler::getOrderHash() now includes order num. [#215] Ability to specify working context for cart. [#218] The product options are active immediately after assigning them to categories. Reverted back #216 due to issues. [#216] [msGetOrder] Need to update pdoTools to version 2.5.6-pl to fix this. [msGetOrder] Orders are show to all if parameter &id is set. [mgr] Fixed number of rows in orders panel. [#216] [msGetOrder] Fixed ability to &includeTVs. Removed wrong "requires" field in msPayment settings. Improved migration of system settings when upgrade from older versions. [msGallery] Improved snippet in case when product has no media source set. Fixed work with autocomplete product options. Fixed duplicate of order number in msOrderHandler. Fixed loop error on change class key from modResource to msProduct. All snippets are completely rewritten. All chunks uses Fenom syntax. [msOrder] Removed chunks tpl.msOrder.delivery, tpl.msOrder.payment and tpl.msOrder.success. [msOrder] Chunk tpl.msOrder.outer renamed to tpl.msOrder. [msCart] Removed chunks tpl.msCart.row and tpl.msCart.empty. [msCart] Chunk tpl.msCart.outer renamed to tpl.msCart. [msGetOrder] Now acts as usual snippet and do not set placeholders to the page by default. [msOptions] Removed chunks tpl.msOptions.outer and tpl.msOptions.row. [msProductOptions] Removed chunks tpl.msProductOptions.outer and tpl.msProductOptions.row. [msGallery] Removed chunks tpl.msGallery.outer, tpl.msGallery.row and tpl.msGallery.empty. [msGallery] Added Fotorama script out from the box. Improved email chunks. Added common email template. Small improvements of product gallery. Emails chunks are now processed by pdoTools. Replaced modX::toJSON and modX::fromJSON calls to native functions. New system to register 3rd party classes of extensions. New system to register 3rd party plugins for objects model. Improved duplicate of products and categories. The data fields of the product are added to the tags of the resource: [[price]], [[article]] etc. Improved registration of JS and CSS on frontend. Improved menu of categories in resources tree. Ability to change class_key of category. 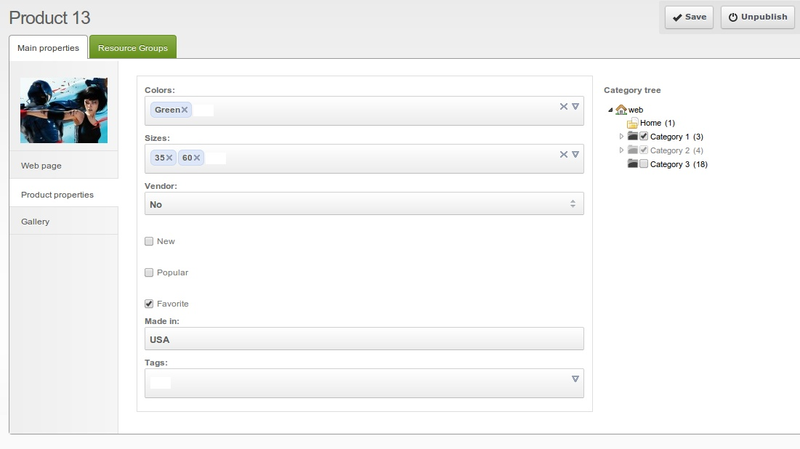 Many improvements of ExtJS category panel and products grid. Setting ms2_category_content_default is now empty by default. Fixed php type of "article" in msProductData xPDO object. Added icons for CRCs in managers tree. Superboxselect and checkbox option types. Fixed bug with empty options after modResource save. hideEmpty parameter in msProductOptions snippet. Custom product options support. More info at modx.pro. Fixed TV showing under content. Added new events: "msOnBeforeGetOrderCost" and "msOnGetOrderCost". [mgr] Direct links to orders in manager. Added support of Tickets 1.6. Fixed modification of order price by delivery and payment in default order handler. Fixed processing of decimal prices in PayPal payment class. Fixed controllers for MODX 2.3. Fixed routes to processors for MODX 2.3. Fixed product getlist processor for MODX 2.3. Fixed sorting products in category grid by clicking on column header. Disabled Bootstrap icons for MODX 2.3. Fixed product gallery for MODX 2.3. Fixed issue with deleting product files children in MODX 2.3. Fixed "autocomplete_err_noquery" error in MODX 2.3. Fixed work of "minishop2-combo-user" in MODX 2.3. Added field "name" in object msOrderProduct for storing pagetitle of the product. Fixed log level in PayPal method. Added integer field "type" to msOrder. 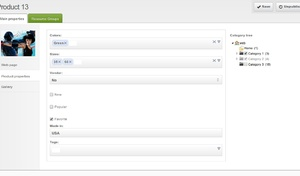 Fixed CustomerProfile connection in schema. Improved price and weight formatting in orders table. [#131] Fixed update of product thumb when you update thumbnails. [#129] [msGetOrder] Fixed setting of placeholders. Fixed work with comments on product panel. [msOrder] Now snippet loads "building", "room" and "comment" from extended field of users profile. [mgr] Fixed parameter "maxUploadSize" in gallery. [#119] Improved compatibility with AjaxManager. [#118] Fixed negative cost in payment and delivery methods. [#112] Restrict cart items to specific contexts. [#111] Fixed remove of products links. [#107] Fixed empty customer field if fullname is not specified. [#106] Additional check of friendly filename in gallery. [#110] Fix generate thumbs on upload for Amazon S3. Fixed counting money spent in new customers. [#104] Fixed placeholder [[+cart_weight]] in emails. [#102] Improved checking of thumbnails url. [#98] Refactored permissions in processors. [#78] Fixed setting flag isfolder to false for old category of the product. Fixed handling of non-ajax requests. Removed unnecessary ajax request on add to cart. Fixed possibly E_NOTICE. Improved rename of files in gallery. Added default media source in product "create" processor. Added default template in product "create" processor. Added buttons in orders management page. Added script for import products in core/components/minishop2/import/csv.php. [#95] Fixed price and weight format. Improved installator. Now you can update chunks on install. Fixed possible errors on thumbnail generation. Fixed E_WARNING in snippet msOptions. Fixed bug with php-apc on create order. Fixed possibly E_NOTICE in snippets. [#77] Fixed change type of existing resource to "msProduct". Added ability to hide tabs of product page in manager. See new system settings. Improved style of horizontal product tabs. Improved proportions in settings tab of category. Improved rename of product images. Improved retrieving of first thumbnail of image in gallery. If you specified wrong "ms2_product_thumbnail_size" parameter, gallery will still work. Added support of non-image files in gallery. Improved snippet "msGallery" for display non-image files. [#84] Fixed displaying of email of vendor in manager. Fixed parameter "&parents" in msProducts. Snippet msProducts supports pdoTools 1.8.0. Parameter "&showHidden" enabled by default. Fixed fatal error with "clearCache" when msProduct created trough processor and it`s parent is not msCategory. Fixed access permissions tab on product update. Fixed getPrice and getWeight calls in snippet msProducts. Added support of component "msDiscount". Added counting of total spent sum by every customer in msCustomerProfile. Fixed placeholders on msProduct page due to issues with @INLINE chunks. Added new events: "msOnGetProductPrice" and "msOnGetProductWeight". Fixed wrong events in database from previous release. Changed "vendor_" to "vendor." in msProduct::toArray() for sameness with the snippet msProducts. Changed default sort in goods grid on "menuindex, ASC". Improved method msOrderHandler::getCost(). Now you can specify additional percent for delivery and payment in manager. New object "msCustomerProfile". It can be extended by plugins like "msProductData". Plugin "miniShop2" can automatic save referrers. In snippet "msProducts" you can override "where", "select", "leftJoin", "innerJoin" and "rightJoin" properties. Added pdoFetch 1.4.1 support. Changed uploader in product gallery to "Plupload" (Thanks to Alex Rahimov). Added check for duplicate images in product gallery by checking hash of the content of file. Added new parameters for media source: "maxUploadWidth" and "maxUploadHeight" for frontend image resize. 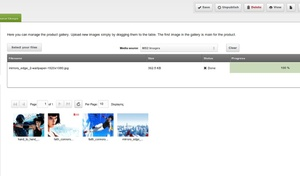 Gallery upload processor now can receive parameters "id" and "file" for external images upload. Added renaming files of product gallery together with thumbnails. [#77] Fixed changing type of existing resource to "msCategory". [#76] Fixed parameter "offset" in msGallery. [#75] Remove multi-category links when category removed. [#74] Refresh data in order from users profile if he is authenticated. [#66] Fixed saving payments methods when create a new delivery. [#65] Added new system events: "msOnBeforeValidateOrderValue" and "msOnValidateOrderValue". [#64] Added ability to stop switching order status from system plugin. [#61] Added ability to sort products in category by drag and drop. [#59] Improved regular expression for email verification. [#59] Improved validation of customer name and email when create order. [#59] msOrderHandler::add() now can return an error. [#59] Improved show\hide of msMiniCart with css. [#58] Fixed PayPal non-USD currency. [#56] Added JSON field "properties" to "msProductFile". [#52] Added ability to customize orders in manager by 3 system setting: "ms2_order_grid_fields", "ms2_order_address_fields" and "ms2_order_product_fields". [#50] Fixed checking of the existence of the Tickets component. [#5] Possible fixed "Cannot execute queries while other unbuffered queries are active" on php < 5.3. Some fixes for MySql STRICT_TRANS_TABLES mode. Added method PayPal::getPaymentLink() for continuing interrupted payment process. You will see [[+payment_link]] in emails. Added parameters "&tplSingle" and "&toSeparatePlaceholders" to snippet msGallery. Now you can specify version of file in "ms2_frontend_js". [#60] Fixed type of field "index" in "msOrder". Improved listing of products in the categories of manager. Improved submit of order form. msProducts saves order of ids received through &resources=``. It need for smooth work with mSearch2. Added loading of lexicons for 3rd party payment methods. They must be named in "msp.%name%.inc.php" format. Removed placeholder [[+id]] from product page because of issues. [#53] Completely refactored call and processing plugin events. 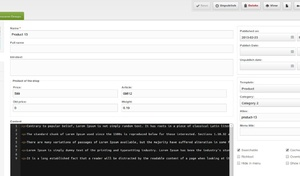 [#45] Added system setting for specify default content of category. Added 2 new events on order remove: "msOnBeforeRemoveOrder" and "msOnRemoveOrder". Improved classes: "msProduct" and "msCategory". Now $modx->getCollection('msProduct'); returns only products. [#44] Enabled duplicate of category. [#42] Added parameter "returnIds" to snippet msProducts. [#41] Fixed panel with tvs on product create. Parameter "resources" not suppressing "parents" in msProducts anymore. Now they working together: resources that are not in parents will not be returned. Snippet msGallery now can to display placeholders like [[+600x]] or [[+x600]]. Fixed display an original image in msGallery. If upgrade, replace placeholders [[+image]] to [[+url]] in chunk "tpl.msGallery.row" manually. Added setting placeholder [[+idx]] to snippets msGallery and msProducts. Added parameter "where" in snippet msGallery, for specify JSON encoded string with additional query data. Added parameters "limit" and "offset" for pagination. msGallery can be used with getPage now. Fixed plugin params on events "msOnBeforeCreateOrder" and "msOnCreateOrder". Now you can change $msOrder by link. Fixed error with no changing status of order in manager. [#38] Added "menuindex" in product fields. [#37] Ability to override method miniShop2::changeOrderStatus() in custom order class. [#36] Removed filter_var(), because of issues on stupid hostings. [#35] Added 2 system setting to enable or disable the remembering of panel tabs. [#32] Enabled displaying of errors when uploading files in product gallery. [#30] "miniShopManagerPolicy" is automatically assigned to a group "Administrators". [#29] Added verification of object instance, when loading neighborhood resources in manager. [#28] Returned the lost fields in images of msGallery. [#26] Improvements of categories tree. [#25] Removed replacing of empty alias to id. Added 2 system setting for switching using resource id as alias for categories and products. Fixed quick fields in snippet msOrder. Update your chunks for delivery and payment methods. Improved "totalVar" placeholder in snippet msGallery. Fixed model. Added proper primary keys for xPDOObjects. Fixed parameter "depth" in snippet "msProducts". New permissions for work with order: "save" and "view". New events for update order. Added ability to add\update\remove products in order. [mgr] Fixed formatting of dates in category grid. [mgr] Fixed decimals in product category grid. Added ability to create system setting "ms2_cart_max_count" to override maximum number of products for one operation. Fixed placeholders in emails subjects. Fixed generation of thumbnails in gallery for working with ImageMagick. Fixed link type "Many to many". Fixed requirement of non-existing permission "update_document" in processors. Added system setting "ms2_price_snippet" for modification of product price. Added system setting "ms2_weight_snippet" for modification of product weight. Product key in msCartHandler now generates with using "$price" and "$weight", because they can be modified when adding to cart. [mgr] Changing of product image now cleans its cache. Small improvements of the snippets at initialization. Added selection of product links in snippet msProducts. See the new snippet properties. Added ability to use msProducts with any modResource class. Added property "tvPrefix" to msProducts for compatibility with getResources. Added property "outputSeparator" to snippets msOptions and msProducts. Added system parameter "ms2_price_format" for specifying how to format price of product. Added system parameter "ms2_price_format_no_zeros" for optional removing extra zeros at the end of price. Added system parameter "ms2_weight_format" for specifying how to format weight of product. Added system parameter "ms2_weight_format_no_zeros" for optional removing extra zeros at the end of weight. Improved saving payment method in order when quickly switch delivery. Integration of PayPal express-checkout payment method. Fixed joining images by rank when includeThumbs. [mgr] Added displaying of nested products in categories. System setting "ms2_category_show_nested_products" can disable it. [mgr] Added the ability to link products together. [mgr] Added link to resource from ordered products. [mgr] Added ability to specify web document for Vendor by property "resource". [#6] Fixed error when order makes authenticated user without email. [#8] Fixed remove of order. [#9] Fixed date formatting in manager for working in Firefox. [#10] Added checking for negative value of adding products in cart. [#12] Added regeneration site maps after new product create. [#14] Added check of "register_globals" on cart/add. Added system setting "ms2_product_thumbnail_size" for setting default size of product thumbnail. Added vendor placeholders on product page. Now you can use [[+vendor.name]], [[+vendor.logo]] etc. Added beta scripts for console converting miniShop1 to miniShop2. Added method miniShop2::getTagged() from MS1. 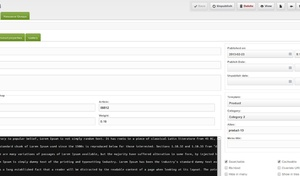 Added ability to load plugins, that can add new or overload existing product fields in model and manager. Added parameters for joining thumbnails and tvs in snippets msProducts, msCart and msGetOrder. Improved save of product options. Fixed automatic install of pdoTools.